We were inspired to make this website because, in our school, many teachers have little to no time to really review the homework from the previous day. Studies have also shown that students always prefer interactive, real-time help. Collabroom uses an interactive whiteboard to get students the help they require with homework. First, a teacher sends out a common server code to all his/her students. The teacher is then able to solve a problem in real time while the entire classroom of students can watch at home. 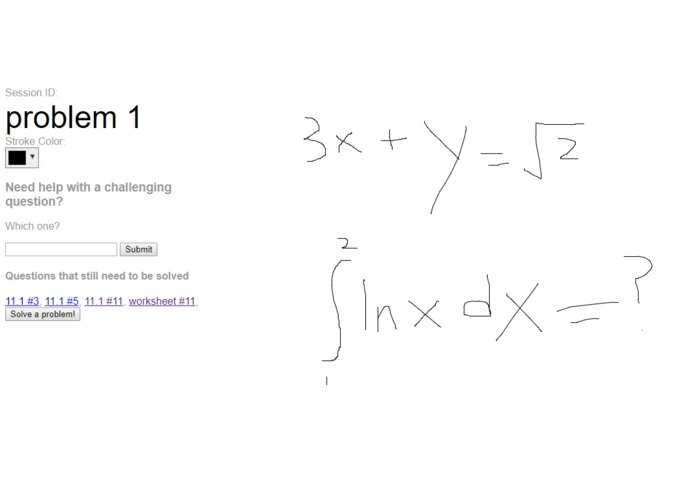 Using Cloudflare apps, we implemented a chat system so students can ask their teacher to re-write a step or do the problem in a different way. Although teachers can do questions and help out their students, other students can also do problems and assist their peers, as teachers don't always have much time outside of school. Collab-Room is a domain, so anyone can have access to it. During the hackathon, we had problems with sending too many packets, memory leaks, and data races. However, we fixed many of these issues and the performance increased from what we began at.